Vons has a deal if you buy $25 worth of P&G products you get a $10 coupon toward a gift card. P&G has a $10 rebate until 9/17 when you spend $30 on Olay, Venus, Covergril, Secret and Pantene products. That ends up being $30 worth of product for $10. I also have quite a few reasons to use the gift card coupon with so many upcoming birthdays. 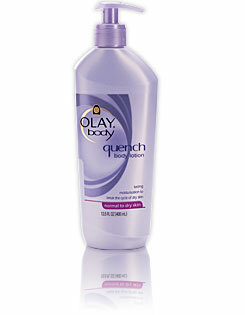 Olay is offering their own Quench for Clunkers. Buy a full size body lotion and send in for a full rebate! I used the last rebate they offered to get 2 full size body washes and 2 full size lotions and I have to say I love the lotion and the body wash. (Well I do love most things that are free 🙂 Go here to get the rebate form and the details. $7/1 Scrubbing Bubbles automatic shower cleaner starter kit and BOGO shower cleaner refill here. Check out Save at Home Mommy for a Scrubbing Bubbles money making deal idea at Target. Don’t forget about these great rebates (some end December 31, 2009). Olay Regenerist Rebate – There is a great $15 rebate on Olay Regenerist Products, go here for the rebate form. Right now at Target you can get the Olay Regenerist Scrub 6.5oz for $7.99 each – use (2) $3/1 from 11/29 SS. Pay $9.98, submit $15.00 Rebate to make this a $5.02 moneymaker. Spend $50 on Olay Facial Moisturizer, Facial Treatments and/or Facial Cleansers and get $20 back. See here for the rebate form. All purchases need to be made between 11/27/09 and 12/27/09. Use the Olay coupons found in the P&G coupon insert from 11/28 to make this deal even better.